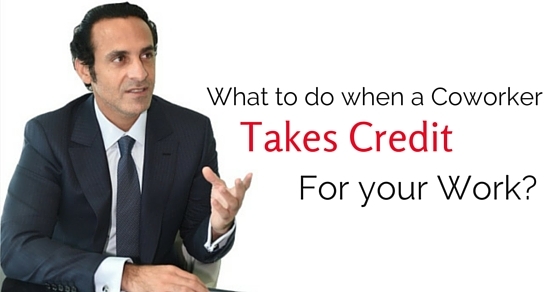 What to do when a Coworker takes Credit for your Work? Any career oriented individual will tell you that the only way to survive in today’s twenty first century business world is by constantly delivering top quality work at all times as well as under all circumstances. Needless to say that everyone wants to get ahead in life and no one wants to remain stagnated. While working in a company you will be faced with a number of problems as well as challenges, one of the most common issues is that chances are that a coworker might be taking credit of others work. So for your benefit given here is a list of what you should do in the event of this happening. Before thinking of doing anything else, it is of paramount importance that you take some time out to understand why exactly your co worker could do such a thing. There is nothing lower than taking credit for someone else’s intellectual labor. But before you go ahead and start pointing fingers you should make it a point to spend some quiet moments in contemplation with yourself, thinking about why such a thing happened- Was there some kind of miscommunication between you two? Or did you consult him while doing this piece of work? So ensure that you do give the matter adequate thought. Once you have given the matter enough thought and are absolutely positive that this certainly is not your fault, then you can go on to think about what your next step is likely to be. Thinking about your next step in a cool, calm as well as collected fashion will ensure that you do not do anything which you might be held accountable at a later point. The manner in which you react as well as the maturity with which you tackle the situation will really go a long way in showing what kind of a character you have. In the event of you being new in the office or even in the event of never having faced such a situation before, you should consult your close friends in the office and see what advice they can give you. It is likely that those who have been around for a while will know the politics which is at work in the office. At the same time you can also be told that such a person, who stole your intellectual labor, has often done so in the past. No matter what it is, ensure that you listen to what everyone has to tell you, very attentively and politely, but only follow the dictates of your own heart as well as mind. Even in the biggest as well as best companies there are always those office gossip mongers who are always trying their level best to drive a rift between two workers. So when you have heard any such information of a co worker taking praise for the work which you have done, it is of paramount importance that you take the trouble to confirm this information and decide upon whether there is any truth to the matter or not. You should never just blindly listen to anything that is being told to you as there are chances that the rumors are completely false. There is some truth in the common saying that there is nothing more important in the world than family, so in the event of this thing really getting to you, you should make it a point to vent to your family members as though they might not be able to understand exactly what it is that you are going through, they are sure to give you a shoulder to cry on. In addition to consulting your family members you should seek council from your friends as well as chances are that they all have been through the same thing in their places of work as well. As mentioned above, it is certainly alright to consult your work place friends as well as ask them what it is that you should do in such a situation; however it is of paramount importance that you do not go about telling any and everyone about what has happened with you. The more people you go about telling, the worse it will be for you as then rather than coming across as the victim you will end up coming across as the bad guy. People like these need to be kept at arm’s length as they have absolutely no qualms about doing any and everything just to climb the ladder of success as well as move on. So in order to really expose this person you should try and gather evidence, to the best of your ability to prove that you have worked tirelessly on this project and the other person has been terribly unethical and taking credit. There is some truth in the common saying that honesty is the best policy so rather than spending your time thinking as well as over thinking about the situation what you can do is just go right ahead and talk to the person concerned to show beyond doubt that you are someone who is certainly not afraid of confrontation of any kind and you will always stand up for what is right. In the event of noticing that the talk with the person concerned has not solved any problem, do not shy away from going right to the senior concerned with your grievance. At the end of the day, it is what your senior as well as boss thinks about you that matters the most. Once this situation has subsided it is of paramount importance that you think about taking some necessary steps which will ensure that such a thing does not happen in the future, under any circumstances. These steps do not have to be big or showy, merely precautionary measures to safeguard your own interests. Dealing with this problematic situation is certainly not easy, but that certainly does not mean that you go about acting like you are a child. Remember that companies are always on the lookout for people who can conduct themselves well at all points in time. So do not let your emotions as well as feelings get the better of you as long as you are within the confines of your office. Just ensure that you put in a brave face at the office so that you silently communicate to the rest of the office that you do not let these small things get to you, you rather focus on the bigger picture. Now that you have chosen to enter into the corporate world and you are willing to do anything to move ahead in life, you should be ready as well as willing to face issues like this which will inevitably come your way. One of the worst things which you can do is sweep the matter under the rug as the moment the vultures of the business world even get a whiff that you are someone who is weak and soft hearted they will have no qualms about steam rolling over you as well as taking advantage of your nature. So have your head on your shoulders at all points of time. Taking some time off in order to come to terms with what has happened is perfectly alright. Do not make any public outbursts of emotion, yet this having been said, you should ensure that you do not let this matter get to you too much. Wallowing in self pity is something that winners never do. So try and pull yourself together at the earliest otherwise in time to come you will become incredibly vulnerable and even start second guessing your own ability as a worker, so let nothing come in the way of you and your responsibilities as that is not the sign of a true leader. Naturally, trying to overcome this situation will take a little while for you because you have taken great pains over trying to do the work and not even getting the praise for it, but having to watch someone else walk away with the credit which is due to you is not merely tough but also really heart wrenching. However you should try and get some consolation from the fact that you are not the first person to have to deal with such a thing in the work place. Such a thing has happened before and it is likely to happen again in the future. Just be happy that you are someone who has integrity. Needless to say, that at no point in time in the future should you ever trust this person again at any cost. If you trust him or her again chances are that you will fall into the same coup again. The business world is a cut throat one indeed where no one is anyone’s friend at all. So ensure that you remain civil as well as polite with him but do not go so far as to think that things will go back to how they were before. Last but certainly not the least is that in the event of noticing, no one is willing to listen to what you have to say or even believe your part of the story, then sad to say you have no other choice but to let the matter go and not pursue it any further. If you continue trying to drag the matter out you will come across looking a tad bit desperate. So mentally accept what has happened and couch that you will continue to give your best at all times as well as under all circumstances. Things like this should never play on your mind for too long a period of time. So these are some of the things which you need to do in order to look into the matter. At the end of the day no matter whether it was a big piece of work or not, as long as you have done it, none other than you should be getting the praise that is due to you. Chances are that if you sit quietly and let this matter slide then this is surely going to keep happening to you. The kinder and quieter you are the more likely people will take advantage of your goodness. So this being said ensure that you follow these steps and handle the situation gracefully and as best you can. Previous articleHow to Give Constructive Feedback after Interview?